George and bill make nice. Spoiler alert: Vegas based companies paid him to do so. When you sit back and think about all the elements that make up the US Government’s ongoing crusade against online gambling, what sticks out most is the giant, glowing, neon elephant in the room. Vegas, and all things connected to same. How is Vegas such an untouchable entity, while competing online poker sites are being toppled like a house of cards? On top of that, further questions (little baby elephants) include; Why is it an NFL rule that teams provide detailed injury reports the Friday before a game? Why does ESPN print the lines of all games, college and professional? Why can people spend their money on state lotteries without fear of breaking the law? Why can those things happen, but online poker (and online gambling in general) continues to be ‘smoked out’? First things first, a quick disclaimer. This writer has no interest in defending the interests of ‘Big Money’, in any field, including online poker. However, if you don’t understand that, at the very least, literally thousands of people are going to lose millions of dollars and their jobs in this disaster, you have your head buried deeper in the sand than those that think this US Government crusade is solely against ‘the evils of gambling’. That is just one of the many knock on effects from this, but let’s take a step back and examine what exactly is going on. As with a myriad of former President Bush’s actions, there is an element of, at the very least, curiosity, attached to the passing of this bill. It was passed on the last day before Congress adjourned for the 2006 elections, meaning there was considerably less people around than usual, meaning in turn less competition and debate against or on the bill. Incredibly, no one on the Senate-House Conference Committee had seen the final language of the bill before it was passed. Bill Frist, former majority leader of the Senate, and Jon Kyl are both credited with progressing the UIGEA’s passage through the Senate. More on Mr Frist shortly. This last-minute rule-making that ‘binds the hands’ of an incoming administration is commonly termed the midnight drop. The final regulations were finalized and released November 12, 2008, and came into effect on January 19, 2009, the day before the Obama administration took office. In part two, Federal authorities ‘dropped the hammer’, as it were. On April 15th 2011, Absolute Poker was named in an indictment by the U.S. Attorney’s Office for the Southern District of New York along with two other popular poker sites — Poker Stars and Full Tilt Poker. The indictment alleges that the sites committed bank fraud, money laundering and illegal gambling offenses by “tricking” U.S. banks into processing online gambling transactions, a violation of the Unlawful Internet Gambling Enforcement Act (which we just discussed). The government seized the websites and more than 75 bank accounts and indicted 11 people on charges of illegal Internet gambling, bank fraud and money laundering. To say the Internet Casino business in the United States is still reeling from this take-down is a major understatement. So why is all this happening? Why has the US Government basically destroyed the online Casino (and gambling) business? If you strip away all the surrounding noise, it really is pretty simple. Two major factors basically. Bill Frist and his ties to land based Casinos, and then the fact that the US Government doesn't want to miss out on the profits from gambling. Pay attention, because here comes the science part. Which Republican Senator championed the Unlawful Internet Gambling Enforcement Act of 2006? 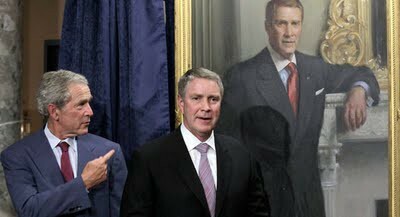 That would be Bill Frist. What does the UIGEA specifically do? It attacks Internet gambling. What interest group has provided thousands of dollars to Bill Frist’s campaign war chests since 1997? Perhaps you are beginning to see a possible conflict of interests developing here? The publicly available breakdown of Frist’s campaign funding from previous years makes fascinating reading. It is all there in black and white. For the period 1997 to 2002, Harrah’s Entertainment contributed $14,250 to the Frist campaign. What does Harrah’s Entertainment do? Glad you asked. Caesars Entertainment Corporation (formerly Harrah’s Entertainment from 1995 to 2010) is a private gaming corporation that owns and operates over 50 casinos, hotels, and seven golf courses under several brands. How about Mandalay Resort Group, which, in 2004, contributed $10,000, that was disclosed, to the Frist campaign. Mandalay Resort Group was, prior to its purchase by MGM, a hotel-casino operator based in Las Vegas, Nevada. Its major properties included Mandalay Bay, Luxor, Excalibur and Circus Circus, as well as half of the Monte Carlo. In terms of market capitalization, it was one of the largest land based casino operators in the world. You would have to imagine it might be in the interest of Harrahs, the Mandalay resort group and other land based Casino contributors to the Frist fund to have its greatest competitors, Internet Casinos, wiped off the map. Does it not strike you as somewhat curious then that one of the politicians they gave large amounts of cash to (and God knows what else) is the champion of a bill that has basically completely destroyed Internet based Casinos in the United States? We can all see what’s going on there, right? Now to the second factor, the US Government missing out on potential profits from gambling. First a very important figure. This is a figure Casinos, both online and land based, don’t want you to know. On average, 8% of those who play online poker turn a profit in any given fiscal year. This is both a commonly known and fiercely protected figure in the gaming community. You can imagine why they don’t want it to become common knowledge. Those in the Casino business are turning a profit against roughly 92% of those who either sit down in front of a computer or come through their doors! The United States government was very unhappy that the money 92% of people were losing on gambling Web sites was, to some extent, going overseas. They have absolutely no problem with you losing money in State lotteries, United States based horse racing and or a Vegas Casino. It just doesn't want the money flowing to operators of these overseas Web sites. You can focus on the devastating financial impact the US Governments crusade has and will have on the fat cats of the Internet poker industry, and stifle a laugh, however make no mistake, the proverbial common man is being hit as hard if not harder than the rich. The online poker companies named in the federal indictment are either already broke, or heading in the same direction. Players who had money with them will probably never see that money again. Shareholders are also left holding thin air. The owners of those companies are obviously in big trouble, but spare a thought for the common staff who are about to or already have lost their jobs. To illustrate how global an issue this is, in Costa Rica, where Absolute Poker and UB (formerly Ultimate Bet) have their operations center, more than 300 customer support and marketing employees – approximately 95 percent of the staff — have already been let go. All over the world people are going to lose their jobs because Bill Frist is funded by land based Casinos, and the US Government is too short sighted to bring internet gambling ‘back into the fold’ and make it a government regulated, audited and taxable commodity. This last point raises one last serious issue. Much like the wildly unsuccessful Prohibition act of the 1930s, where people still found a way to drink, people are still going to play poker, people are still going to place bets. The US Government claims to be attempting to combat organized crime, when all they are doing is actively pushing people into the waiting, open arms of same. Instead of basically making a martyr out of it, strong regulation, taxing and auditing of the online gambling world would have had many positive knock-on effects. It would not, however, have lined Bill Frist’s pockets with cash. And perhaps that’s the single biggest reason ‘Joe Punter’ is going to be doing his betting in an alley or a bar, handing over his cash to dubious, shady bookies. Perhaps that’s the single largest reason why thousands of talented graphic designers, translators, Project Managers, Quality Assurance specialists, software engineers and everything in between worldwide are now out of a job. More and more stories are cropping up online where long time poker players are finding themselves sitting at a $5 table in some Casino in Vegas. They are sitting there because their favourite online tables have been shut down. Those were shut down by a bill championed by Bill Frist. That gentleman’s political life has been funded in part by those same land based Casinos that our lonely, somewhat lost, former online player is now sitting in. Call it whatever you want, the circle of life, the food chain, the American Dream. Whatever it is, it’s blatantly obvious what’s going on. I hope, at the very least, Senator Bill Frist gets the best comped rooms available in Vegas when he’s in town. He has certainly earned it.